The Ethel M factory, Gift Shop and Cactus Garden are always must-sees for Las Vegas valley locals and their visitors…especially at holiday time. 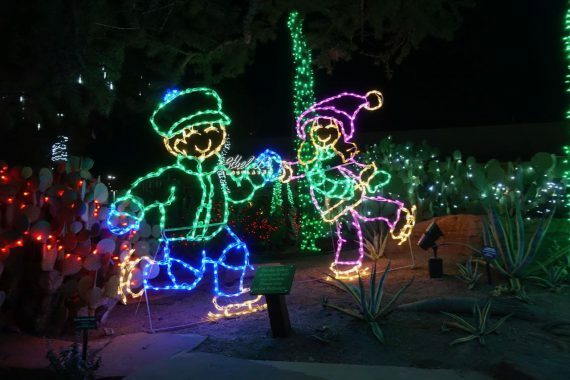 This year marks the 24th year the Ethel M Cactus Garden has turned into a nighttime holiday lights extravaganza featuring over 1 million lights and holiday music playing throughout. With two visitors from Illinois in tow, I once again visited Ethel M. Lots of folks had the same idea. Families of all ages enjoyed touring the garden. 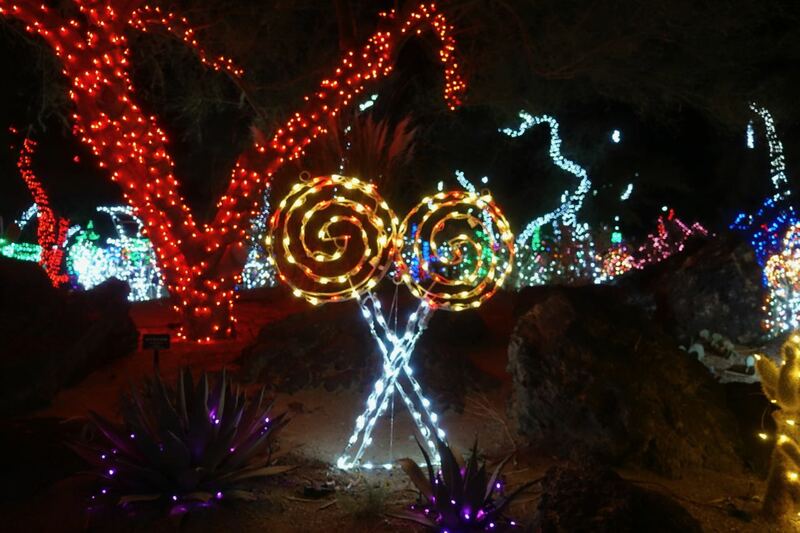 I saw toddlers in strollers and grandmothers in wheel chairs and every age in between. 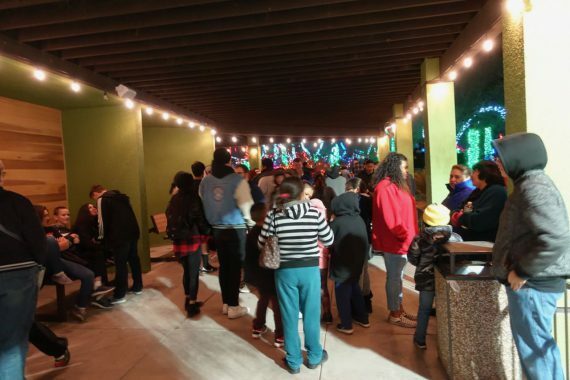 Later when we stopped for hot chocolate, the lines were long, but the rich chocolate drink (with whipped cream, of course) was worth the wait…and delicious. Below are some of the photos from this year’s visit. 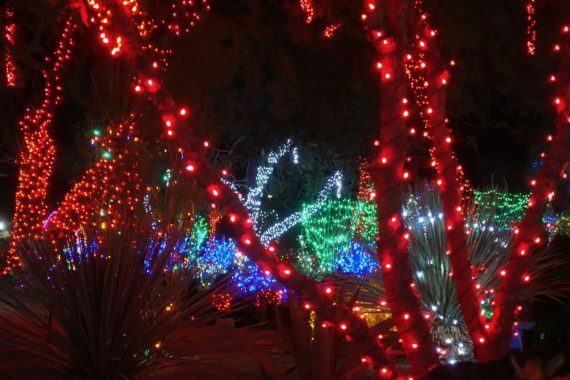 Up close and far away, the Cactus Garden holiday lights are spectacular. Ethel M’s Holiday Cactus Garden opened November 7 and will stay open trough January 1. 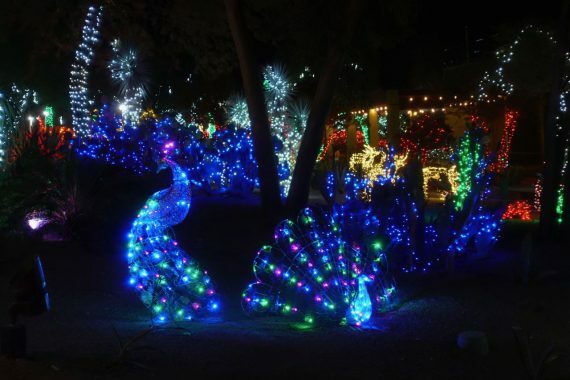 The Holiday Cactus Garden hours are from sundown to 10 p.m.
Peacocks were a particularly spectacular display this year. 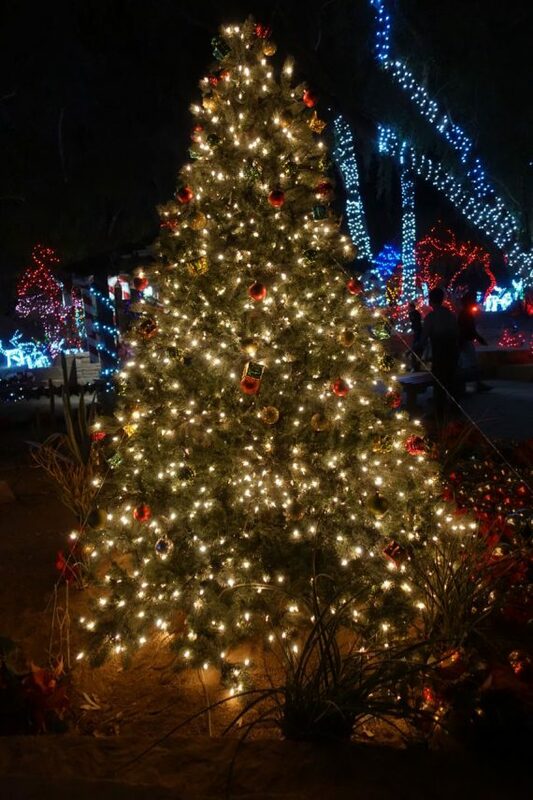 A traditional holiday tree is part of the garden decor. 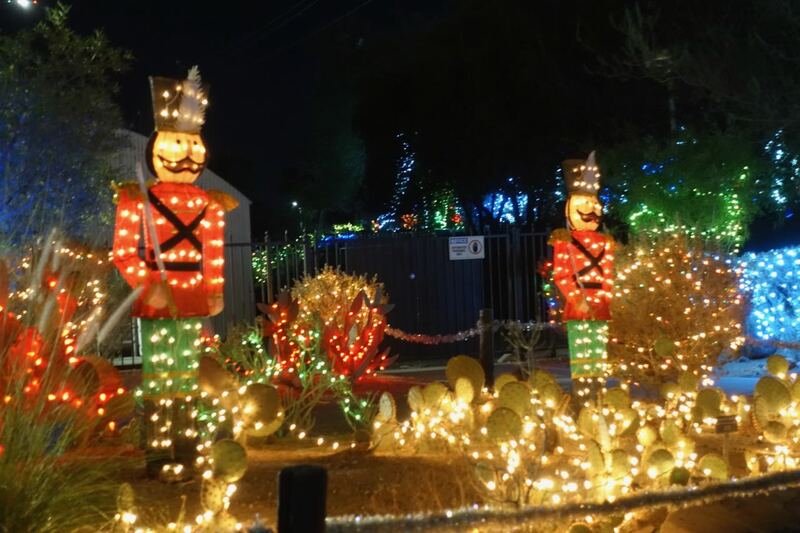 What is a holiday display without wooden soldiers…with lights! 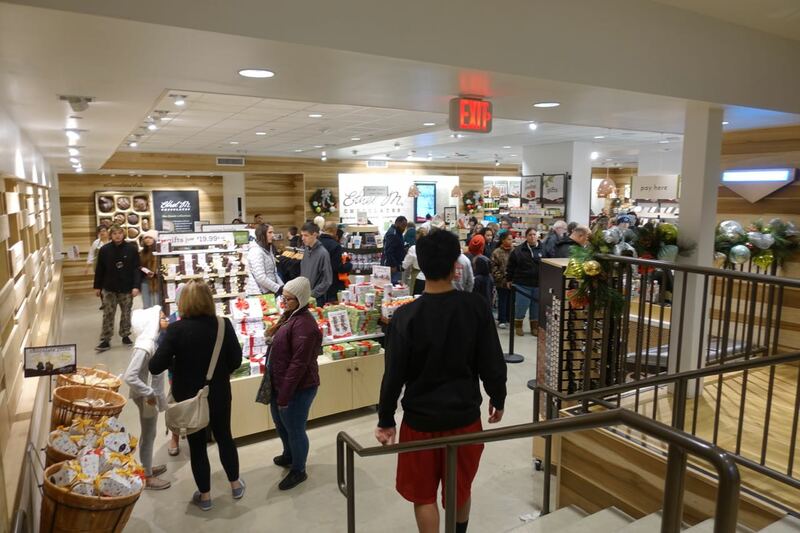 The weekend crowds can be huge; a weeknight visit is busy, but the lines aren’t quite as long. 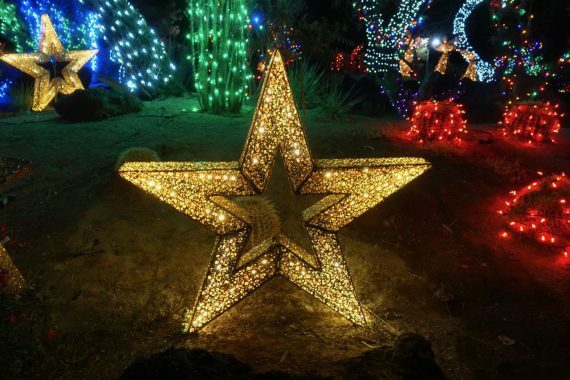 This lighted star is one of many that are part of the Ethel M Cactus Garden display. 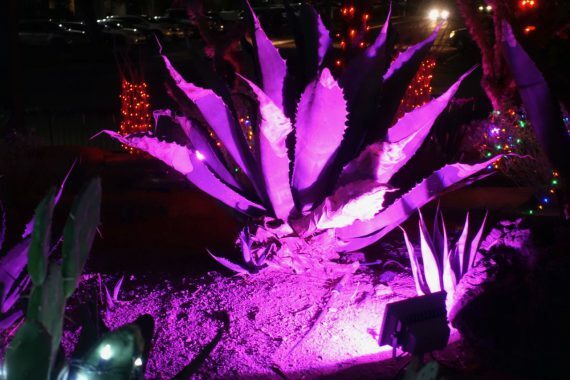 Sometimes, just shining a light on a beautiful plant is all that is needed. The cactus garden actually has an artificial ice skating rink, but these figures don’t need that rink to have fun. 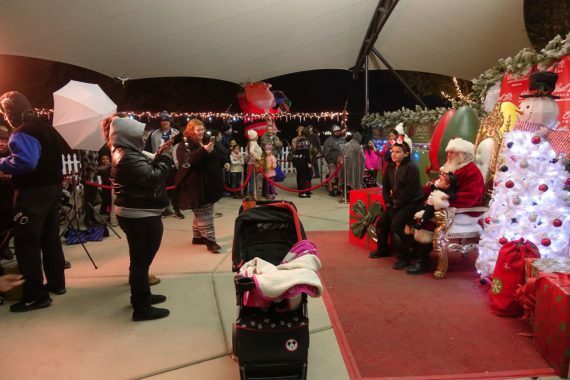 Follow the signs to see Santa on the weekends — a VERY popular guy. 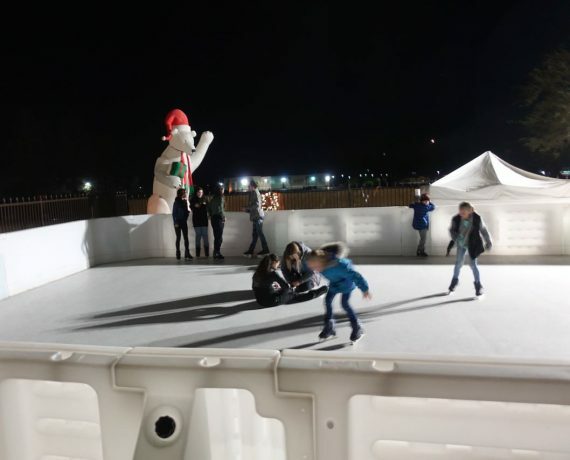 The skating rink located behind Santa’s workshop is available (for a price) from 10 a.m.till 10 p.m. during the holidays. Inside the Ethel M Gift Shop, folks can buy boxes and bags of chocolates, chocolate bars AND Ethel M’s famous hot chocolate: two sizes: 12 oz.- 4.99; 16 oz- 6.99. 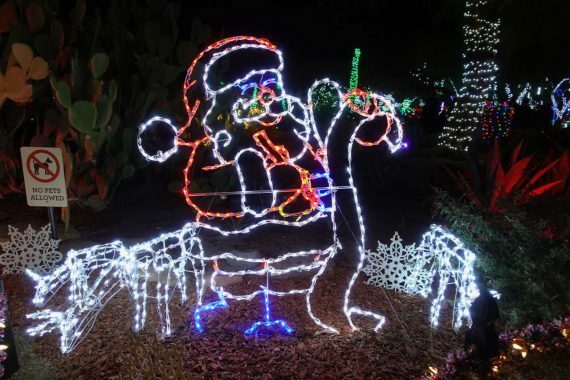 Santa in lights surely wishes all Cactus Garden visitors a very happy holiday. I went to see that one year. So fun! But I couldn’t get near Santa, his fans were in around-the-block lines. I didn’t care, though. I’m pretty sure I was on the naughty list.